Where to Buy: You can buy yours from here. 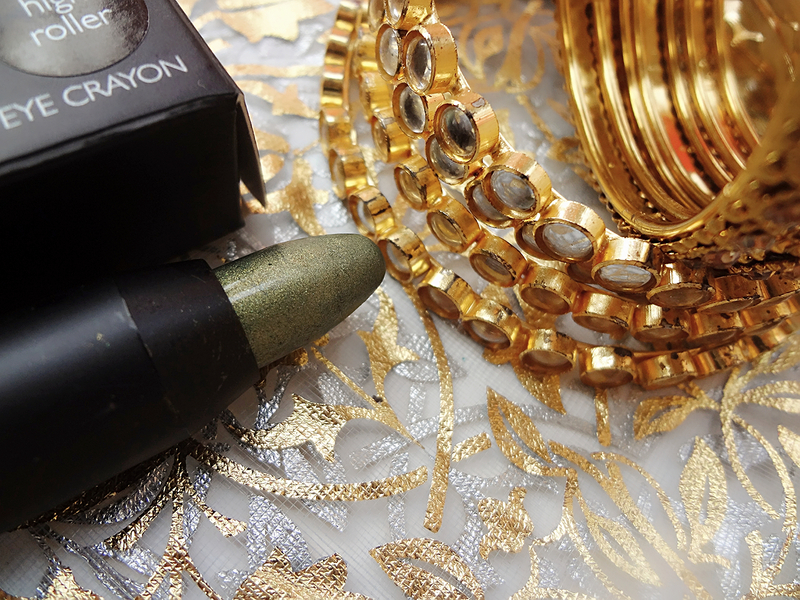 Shade: ‘High Roller’ is an olive shade with finely grinded golden shimmers within. Texture: The texture of this crayon is creamy soft. It glides on like lump of butter over hot paranthas! But it still manages to retain its actual shape. Packaging: Be a Bombshell Eye Crayon comes in an all black cardboard covering which comprises of the ingredient list. It lacks a mention of the retail price due to which I had to search around for my Fab Bag card of the September month. The body of the crayon is matte to touch with a transparent plastic cap which closes well but at this price point, you do expect more than a mere flimsy lid. Thankfully, it comes in a twist up pen form, so you save yourself time as well as the actual product from being wasted while sharpening. Since it’s a crayon, the tip is kept blunt and you gotta be extra careful if you intend to line your upper lash line with it for a quick colored eyeliner look. I have really wanted to be a proud owner of an eyeshadow crayon. 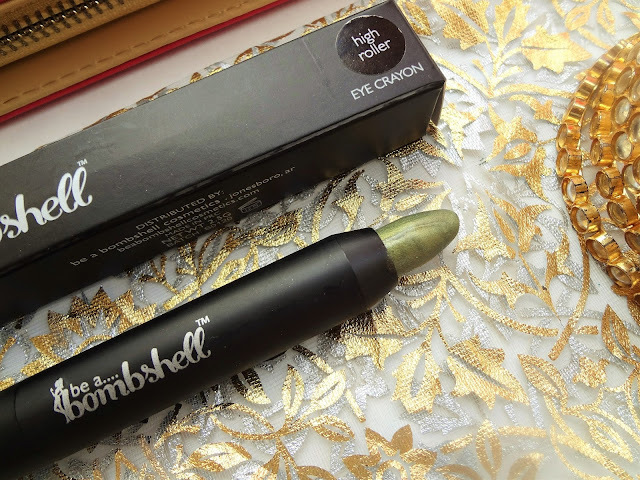 When I saw this as one of the option while booking my September 2016 Fab Bag, I looked aside the new launch of Sugar Cosmetics Mascara and chose this. I had high expectations! 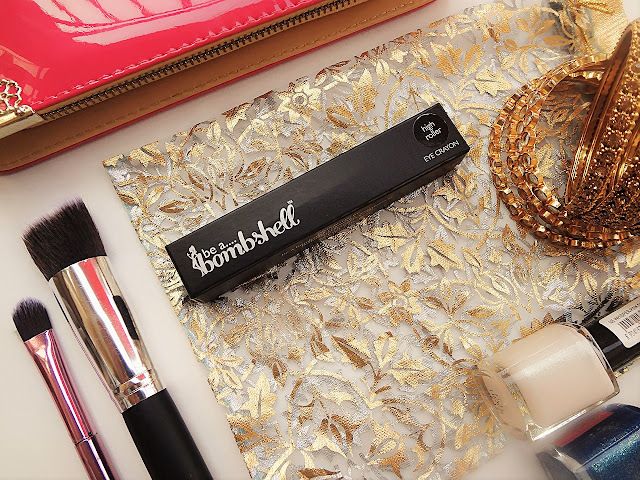 And the name of the shade says High Roller. But it is definitely a disappointment. 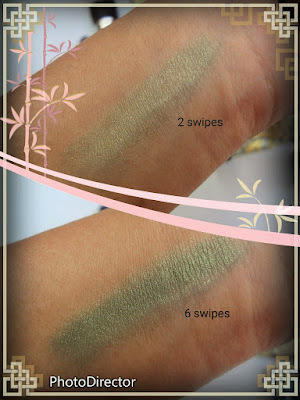 The pigmentation is something which was greatly overlooked by the brand. On the eyelids, the color does not show up quite well. Even post many layers, it does not provide enough opacity. The color does move from one place to another in the process of application also. Do not think of smudging it because you’d end up with barely a light tint. It would perform a little better with an eyeshadow primer. 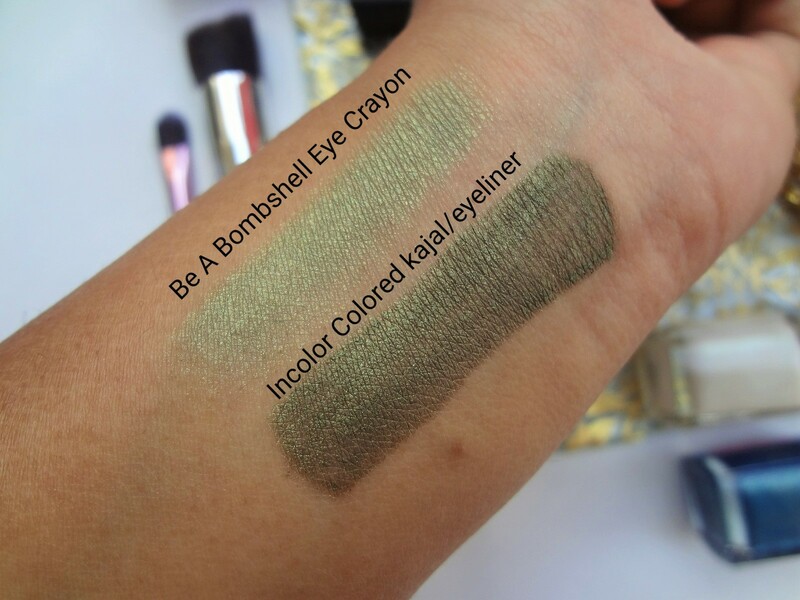 I guess this crayon is meant to be used as an eyeshadow base for powdered eyeshadows to stick upon and give an intensified overall appearance. Itself as an eyeshadow crayon, it fails terribly! To be honest, I have a Incolor eyeliner in olive green color which is comparatively darker in shade and caters much more pigmentation; priced barely at 50 bucks! The longevity too is minute. It survives for approximately 2 hours and is not smudge-proof. Verdict: You can skip upon this one for more affordable ones! Maybe I should try the Rimmel one instead.